The R-EV1 skinsuit represents the extreme evolution of bike wear. A single garment, light and aerodynamic, with 220 g of weight (20% lighter than the two single R-EV1 pieces) that comes from time trial skinsuis. 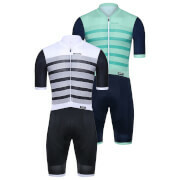 It combines the features of a classical jersey and bibshorts, with the advantage of the aerodynamic perfomance of a time trial skinsuit. Quick drying and maximum breathability for the frontal part of the body with the micro perforated fabric. 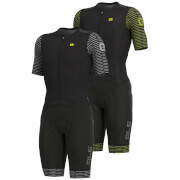 The sleeves made in a strutture Mesh Dragon material allows a better ventilation, breathability and aerodynamics. 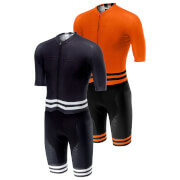 The lower part is inspired by the R-EV1 bibshort with a good muscular support.